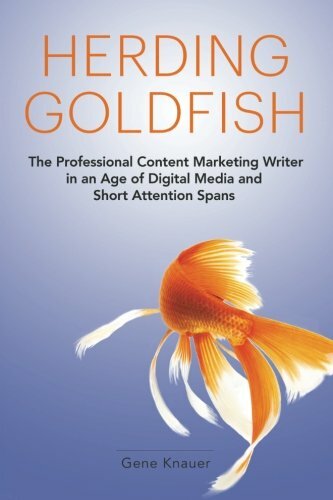 “Herding Goldfish: The Professional Content Marketing Writer in an Age of Digital Media and Short Attention Spans” provides an overview of the what, how, and why of writing marketing communications. It includes marketing best practices written from the perspective of the content marketing writer; an overview of the kinds of communications you’ll write; creative, research, and interviewing techniques; and advice on how to market your services. Several audiences will find this book helpful. Anyone who is tasked with writing marketing communications for online, print, or broadcast media will find topics and guidance that could help them produce better work. Marketing communications professionals, product managers, and others who must write and produce sales and thought leadership content for products and services should find it useful, too. Students and those in transitional career stages who enjoy writing and are thinking about making a career of it will get an idea of what working as a content marketing writer might involve along with tips for working more efficiently, creatively, and successfully. Gene Knauer is a senior content marketing writer and Silicon Valley veteran. He has written for a broad clientele of world-famous technology product and service companies and emerging startups. Content topics span mobile networks; programmable networks; public, private, and hybrid cloud services; hyperscale data centers; Big Data analytics; system on a chip standards; nanotechnology; consulting services; enterprise applications; personal and team productivity software; and much more. His articles have appeared in American Laboratory, Computerworld, The Futurist, the Los Angeles Times, Mobile World Congress Daily, Packet Magazine, and other trade and corporate publications and newsletters. His clientele has included Autodesk, BEA Systems, Brocade, Cisco Systems, Ericsson, Fujitsu, Microsoft, NTT, Oracle, Sun Microsystems, and VCE.